In the United States, disadvantaged minority youth are disproportionately likely to be both victims and perpetrators of violent crime. Although many policymakers believe that joblessness contributes to violence, evaluations of most traditional employment programs have found little effect on crime among youth. Researchers tested whether a summer jobs program for youth still in school, which shifted focus from remediation to prevention, could impact rates of violent-crime arrests in poor neighborhoods of Chicago. Youth who received an offer of summer employment and mentorship had lower rates of violent-crime arrests throughout the following year. Every day, acts of violence injure more than 6,000 people in the United States. These incidents disproportionately involve disadvantaged minority youth; young people are twice as likely as adults to be both victims and perpetrators of violent crime. Many policymakers believe that joblessness contributes to the cycle of violence by increasing stress, weakening social bonds, and giving an individual “less to lose.” However, most evaluations of public employment and training programs—a common policy response—have found no effects on youth criminal behavior. Summer job programs hold promise as a shorter-term, lower-cost way to develop youths’ skills and help them learn how to navigate a work environment, giving them more options for the future. Programs that target youth while they are still in school may be more effective than remedial interventions after they are already out of school and struggling in the labor market. Can placing youth in a summer job affect their rates of violent crime? Researchers partnered with One Summer Plus (OSP), a public summer jobs program in Chicago. OSP partners with local community organizations to place youth in nonprofit and government jobs (such as camp counselors, community garden workers, or office assistants). Study participants were 8th to 12th grade students in high-violence Chicago schools , ranging in age from 14 to 21 years. Over 90 percent were eligible for free or reduced-price lunches and almost all were African-American. Students came from highly disadvantaged neighborhoods with high rates of unemployment, poverty, and violent crime. On average, participants had missed six weeks of school during the previous year and had grade point averages around a 2.3 (on a 4.0-point scale). About 20 percent had been previously been arrested. Jobs only: OSP offered youth 25 hours per week of employment in a nonprofit or government job, paid at Illinois’ minimum wage (US$8.25 per hour at the time of this study). OSP also assigned youth to a job mentor—designated adults who made regular visits to the workplace—at a ratio of ten students per mentor. Mentors helped students learn how to be successful employees and how to navigate barriers to employment such as transportation, family responsibilities, and conflicts with supervisors. Jobs and Socio-Emotional Learning (SEL) training: OSP offered youth paid employment at minimum wage in a nonprofit or government job and assigned them to a mentor. However, instead of 25 hours per week of work, they were paid for 15 hours per week of work and 10 hours per week of SEL training. SEL is a curriculum based on cognitive behavioral therapy principles that teaches youth to understand and manage the thoughts, emotions, and behavioral tendencies that might interfere with employment (for example, the inclination to snap defensively at someone offering constructive criticism). Comparison group: OSP did not offer youth employment or mentorship. Researchers used administrative records from Chicago Public Schools from the 2011-2012 school year to examine student characteristics before the start of the summer program. After the program’s end, researchers matched administrative records from the 2012-2013 school year with arrest records from the Chicago Police Department. Researchers examined the program’s impact on schooling outcomes the following academic year and arrests through 16 months after random assignment. Youth who received an offer of summer employment through OSP (both jobs-only and jobs with SEL) were less likely to be involved in violent crime. For each 100 youth offered employment, four fewer were arrested for violent crimes relative to youth who received no job offer (a 43 percent decrease ). The program had no effect on other types of arrests , and there was no change in school attendance. Results indicate that the decrease in violent-crime arrests is not simply an “incapacitation” effect of youth having less free time to engage in crime over the summer: Most of the reduction in violent-crime arrests occurred after the end of the program. The decline persisted 13 months later, suggesting that youths’ summer experiences impacted their behavior after the program. While both program groups showed declines in violent-crime arrests, substituting SEL training for work hours had no additional effect. Thus, any behavior change is likely due to an aspect of the jobs program included in both interventions. For example, youth in both groups may have learned interpersonal skills from mentors, or the work experience itself may have improved their self-control and developed confidence. Results suggest that a well-targeted, low-cost summer job program can impact youth violence, and that such programs may be more effective by focusing on prevention rather than remediation. Heller, Sara B. 2014. 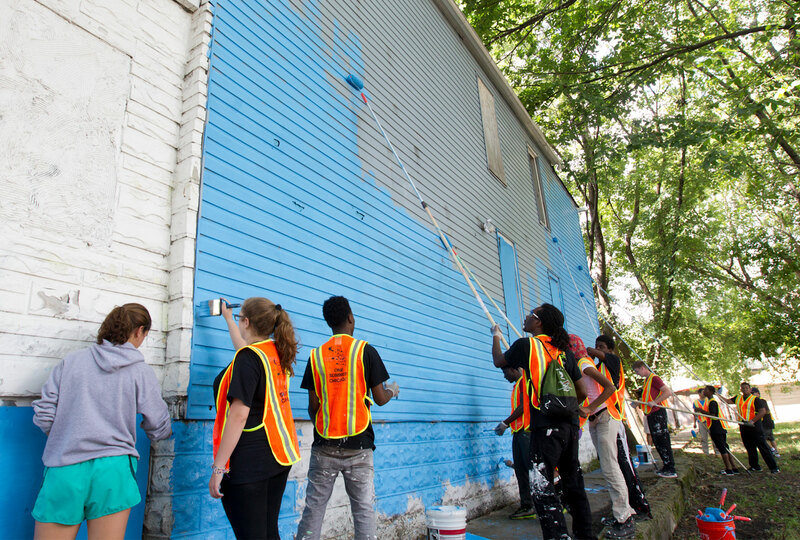 "Summer Jobs Reduce Violence Among Disadvantaged Youth." Science 346(6214): 1219-1223. Davis, Jonathan M.V., and Sara B. Heller "Rethinking the Benefits of Youth Employment Programs: The Heterogeneous Effects of Summer Jobs." NBER Working Paper, May 2017.